Since returning home from Hawaii, I have been on a bit of a seafood kick (exhibit A). If you know me, you know I have never been on a seafood kick ever in my life. But I am embracing it with open arms. Unfortunately, due to my lack of experience with seafood, I am not the best at cooking it. Which is why I am drawn to recipes where I don't have do too much cooking (again, see exhibit A). 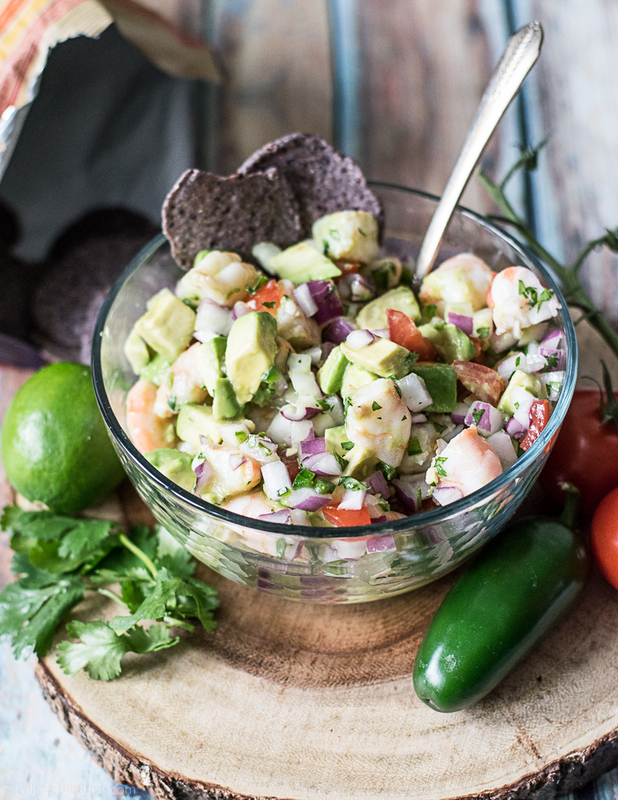 Some shrimp ceviche recipes that you may see around the internet don't actually the cook the shrimp AT ALL. Which is great if you don't feel like cooking or don't have access to a heat source. However, I did have access to a heat source and I had no desire to use raw shrimp (and am a bit of a wuss), so I quickly cooked my shrimp in some boiling water before making my ceviche. If you want to try your hand at "cooking" raw shrimp with lime juice, be my guest. Instead I "marinated" my already cooked and chopped shrimp in lime juice for about 15 minutes so I still had the limey-citrus flavor. 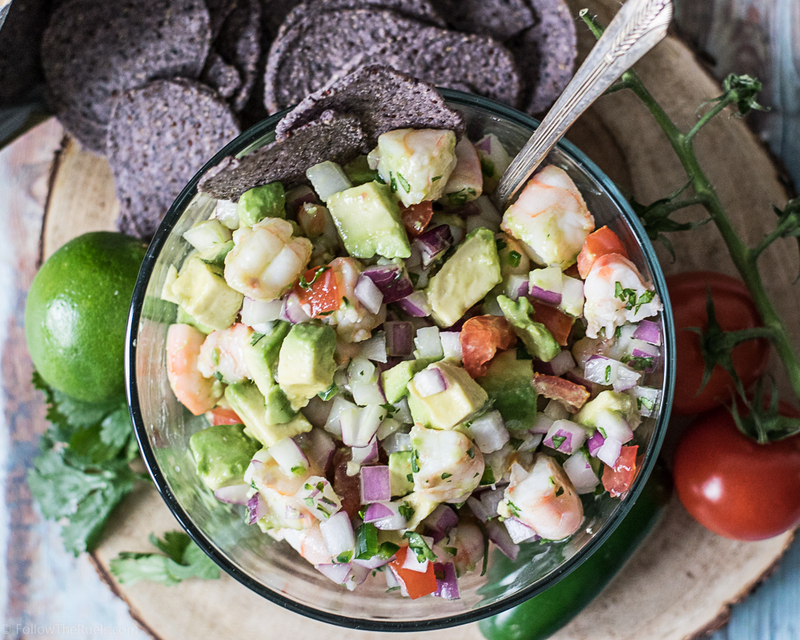 While the shrimp soaked in the lime juice, I chopped up an avocado, tomato, red onion, and jalapeno. Then I mixed all of those ingredients in with the shrimp. It's almost like making a chunky shrimp salsa. And that's exactly how we ate it! On it's own with tortilla chips! If you love shrimp and hate to cook, you will love this recipe. Just chop up a bunch of stuff and let it sit in some lime juice and you've got yourself a snack, an appetizer, or a meal! It actually made a really nice, light dinner all on it's own. But you could also eat the shrimp ceviche on a tortilla (like a taco), in a lettuce wrap; or on a cracker. But I'm partial to the tortilla chips, because they make this dish that much easier! Bring a pot of water to a boil. Drop shrimp into water and cook for 60 seconds, or until shrimp turn pink. Transfer shrimp to an ice bath to cool for another 1-2 minutes. Chop up shrimp into 1/2 inch pieces. Place in a bowl and top pour all but 2 tbsp of the lime juice over the shrimp. Set in the fridge for 15 minutes. In a separate bowl, add avocado, tomato, red onion, garlic, and jalapeno. Strain lime juice from shrimp, then add shrimp to the bowl with the rest of the ingredients. Sprinkle the remaining lime juice, cilantro, salt, and pepper over top, then toss to coat. Serve immediately. If not serving right away, add avocado just before you serve.